When it comes to naming heavy metal luxury rides, usually the big Mercedes S-Class, followed by the BMW 7-series, comes to mind. These two heavy hitters, especially the S-Class, have established themselves in the upper ranks as preferred choices in the prestige class. 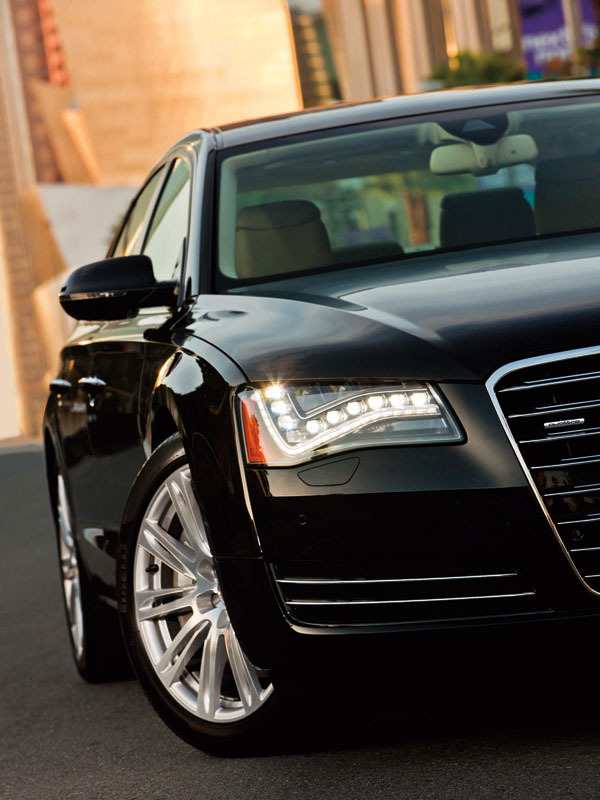 The Audi A8 usually comes after a slight pause. Why is that? Brand heritage, or perhaps lack of awareness? It’s only lately that Audi has been making huge inroads into the luxury market, and now more so into the upper premium segments with the fabulous mid-engined R8 supercar and the A8 luxury flagship. Perhaps it was the overachieving “I want to play in the big leagues” VW Phaeton that tried to compete within the family that drew attention away from the wonderfully engineered A8. That’s another story altogether. The Audi A8 that was one of the first to market with a high-tech, lightweight, all-aluminum body structure that kept its weight within reasonable numbers. This was on the first-generation A8 launched in the mid-90s. Being constructed of aluminum brings benefits in acceleration, braking, cornering and fuel economy, not to mention engineering bragging rights. The downside is the high costs of material, assembly and development. mind-boggling 500-hp. Acceleration times are now in the big leagues, where the big Mercedes S63 and S65 AMGs, Porsche Panameras and Aston Martin Rapides play. Its $172,000 price tag also ensures exclusivity. 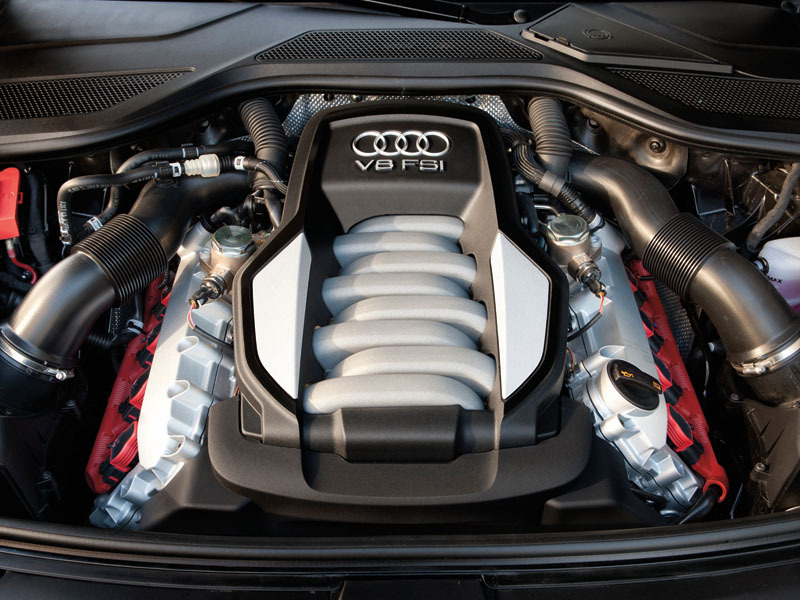 While we’re getting ahead of ourselves with giddy performance numbers of the W-12 powered Audi A8, the mainstay model is the V-8-engined standard grade, which also carries a hefty $99,700 entry fee. Soon to be released will be a supercharged V-6-powered model that shares its engine with the mid-size A6 sedan. 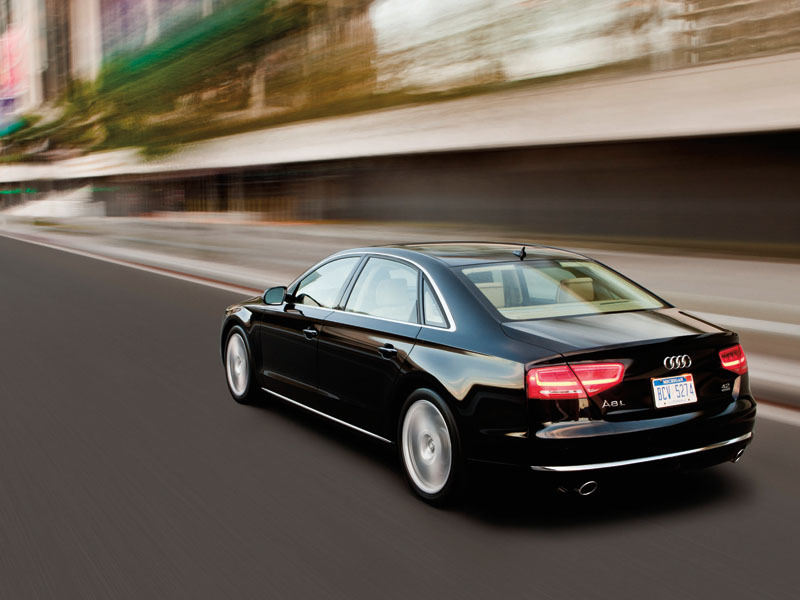 When it comes to esthetics, the A8’s handsome and stylish body casts a strong street presence. The crisp lines and bold front grille is unmistakable Audi design, and ties the styling theme with the rest of the sedans in Audi’s vehicle lineup. An intriguing styling piece of the A8 is the optional full LED front headlamp design that looks sinister in appearance. 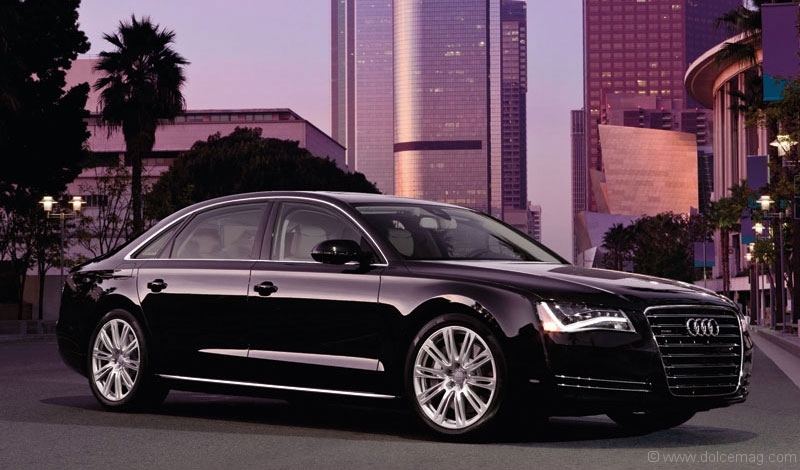 When lit, the LEDs give the A8 a sophisticated, high-tech nighttime look that is the envy of its competitors. A choice of large diameter wheels, ranging from 19 – 20 inches in various attractive designs also helps to dress up the exterior. It’s inside what truly counts. Even without all the fancy gadgets and conveniences, the cabin design earns top marks in esthetics. The styling of the dash, door panels, supple leather coverings and top-grade materials, especially the wood trim, is worth the price of entry. High attention to detail is worthy of close inspection, as the fit and finish is beyond reproach. An interesting piece is the specially shaped gear lever handle in leather, chrome and aluminum. Seating, particularly for rear occupants, brings opulence to new heights as the comfort level is something to behold. If more rear seat legroom is needed, the A8 is also available as a long wheelbase model with an additional five inches of legroom. It’s the perfect isolation chamber to spend hours in, whether in gridlock traffic or long-distance road trips. A must-have feature is the available Bang and Olufsen premium sound system, which can pump up to 1,400 watts of audio power through its 19 speakers. Watching movies or listening to a DVD audio disc is an experience one won’t forget. Crisp, crystal-clear highs and ground-pounding bass notes will never sound the same in other audio systems. The full-size Audi A8 is definitely making its mark in the prestige arena, thanks to its sophistication in the areas of styling, technology, engineering and, especially, cabin design, which takes first-class travel to new heights.